Feast your eyes on the Ontario Walnut Bar Stool Brown, a timeless design that fuses past and present seamlessly. With a gorgeous brown seat and a rich walnut finished frame, the Ontario is a sumptuous item with a classic sense of exclusiveness. 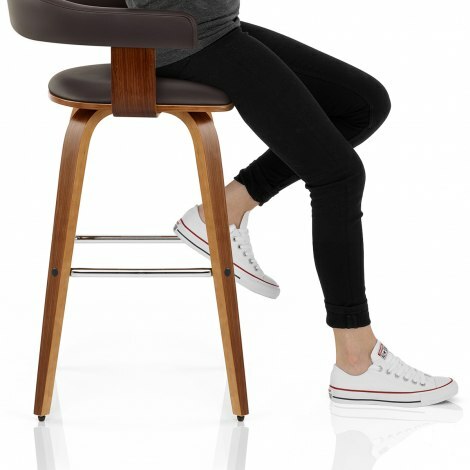 Upholstered in plush brown faux leather, the comfortably padded seat and ergonomically curved backrest encompass the body for total support. The beautiful bentwood legs are crafted from a solid wooden frame, they boast a sleek walnut finish and taper down from beneath the seat. A square chrome bracing bars offers a helpful perching spot for the feet, whilst the segment the gap in the backrest delivers a visually space saving effect. Last but not least, the Ontario has protective plugs to help minimise marks to flooring, which are also adjustable to cater for uneven floor surfaces. "Perfect stools for a perfect kitchen! 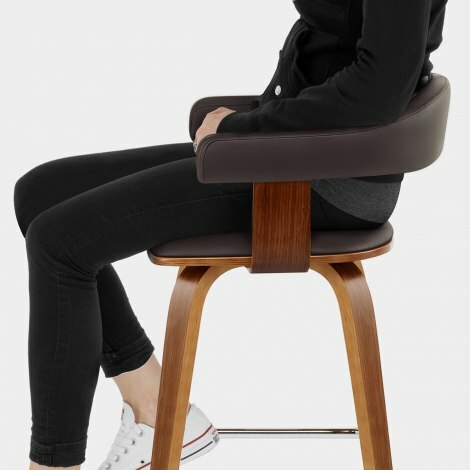 Thanks"
Good service and practical stools for everyday use - `Atlantic Shopping very customer friendly as I ordered the wrong colour first and no issue. Thank you would recommend Atlantic to others.